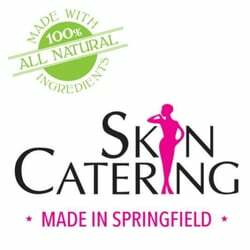 SkinCatering Blog | …Cater To Your Spirit! We are dedicated to using only natural ingredients to ensure the most beneficial, glowing treatments possible for your sensitive skin. On August 15, 2016 SkinCatering became PETA-APPROVED as a cruelty-free & vegan certified company! We are also gluten-free. Because we create all of our products & treatments from scratch, we know absolutely every ingredient that goes into our skincare & spa treatments and can custom-create the treatments to avoid your known allergies & sensitivities. Science geeks meets beauty buffs! We make it comfortable for non-traditional users to try skin care. Kim & Leanne use their knowledge of the Circulatory, Integumentary, Endocrine, and Lymphatic systems to produce a skincare line that works with your body to produce the best skin results. Opening our official doors in 2011, we were an all-natural spa in Springfield, MA that began making our line of products in our spa kitchen as a way to cater to our clients without using harmful chemicals. Our services grew in popularity because of this and clients began requesting products they could take home to continue their care, without synthetics. As online orders increased and clients recommended us to friends and family all over North America because of the wonderful results they were seeing, the wholesale side of the company was established. We enjoy building a relationship with our carriers. We don’t want our products to just sit on your shelf, we want to be partners. Creating the product ourselves in our new, larger facility allows us control over the quality and quantity of each batch. This is an advantage for you because we are able to customize orders, and in some cases, create exclusive products. “Anybody dealing with stress or just want to treat yourself Skincatering is the place to go. Highly recommend here ♥” – Donna F.
“Thank you Nicole at SkinCatering for my massage! What a nice way to spend a rainy afternoon. Can’t wait to try my new products–Pumpkin Spice Body Scrub and Pumpkin Spice Frosting. They smell amazing! !” – Lori G.
“Thank you so much Kim! My facial was very relaxing and my skin feels great! You are the perfect addition to the Skin Catering team!” – Kerri T.
“Mood, sleep, focus… All improved after yesterday’s massage.” – Apryl B. Thank you for, yet again, another wonderful massage. The peppermint foot wrap was so nice, my feet are still tingling. You’re wonderful at what you do and so many people are lucky you followed your dreams. I look forward to using the shave gel, I’ll write my reviews on that also!! Thanks again, I look forward to my next massage already. Leanne, I have been using your make up remover, and it’s wonderful. I have to admit i dont usually even use this kind of product. My make up comes off at night with a quick facial soap from CVS. Since using this, my eye makeup comes off easily, the crepey skin around my eyes is more soft and hydrated, and it is great knowing that everything is natural! thanks for letting me try this product! I had previously had one facial and it was a traumatizing experience. I came and got a signature facial from Kim and it was amazing! Cannot wait to come back! You guys are great and to too it off I LOVE how easy it is to book appointments, the reminders, and the emailed receipts! Just great! Thanks! You’re welcome! We’re so happy you found us and that you’re loving your skin again. Leanne, the massage you game me at the GIRLS JUST WANNA HAVE FUN event at the Delaney House last Friday was the best EVER! Thank you SO much!!!! !